Ample wine is consumed, but the glasses figuratively are half-empty in HBO’s very moody and sometimes draining Big Little Lies. Adapted from the bestselling, same-named 2014 novel by Liane Moriarty, it’s a star vehicle for Reese Witherspoon and Nicole Kidman, who also are co-executive producers with TV vet David E. Kelley (Ally McBeal, Boston Public and Amazon’s recent Goliath). They’ve fashioned a seven-episode miniseries coated with thick layers of unfulfillment for the outwardly pampered and privileged women of Monterey, CA. Three of them live in ocean view splendor while a fourth principal hunkers down in a comparative hovel after migrating from Santa Cruz in hopes of starting a new life. The entire miniseries is directed by Jean-Marc Vallee, whose most notable feature films to date are the multiple Oscar-winning Dallas Buyers Club and Wild, for which Witherspoon received an acting nomination. That’s Witherspoon’s character, a loud and willful bundle of nerves with a balky teen daughter named Abby (Kathryn Newton) from a previous marriage and six-year-old Chloe (Darby Camp) from a current one. Kidman plays her best friend, Celeste Wright, who’s married to the constantly traveling but possessive Perry Wright (Alexander Skarsgard from True Blood). Skarsgard’s not a vampire this time, but he’s slowly draining the life out of Celeste with his physical and recurrently violent demands. It’s been something of a sexual turn-on for both of them, but Celeste is starting to realize the self-destructive and dangerous course they’re on. Perry otherwise is a benign daddy to their twin sons, Max and Josh (Nicholas and Cameron Crovetti), sending them into giggles with his impressions of a flesh-eating monster. Oh, the symbolism. The newcomer is Jane Chapman (Shailene Woodley), whose little son, Ziggy (Iain Armitage), was born after she was sexually assaulted and raped. Madeline and Celeste quickly bond with her, and the three regularly have coffee together at an oceanside cafe. Fourth wheel Renata Klein (Laura Dern) is a prosperous businesswoman with a little girl named Annabella (Ivy George) and a husband, Gordon (Jeffrey Nordling), who endures her verbal volatility while also trying to tame it. All of the little kids are first-graders. And after just the first day of class, Annabella emerges with a bruise on her neck and fingers the new kid, Ziggy, as the bullying perpetrator. He emphatically denies doing anything, but the die is cast and the resentments escalate. Those who have read Moriarty’s book know the identities of both the victim and the perpetrator. But there’s no guarantee that Kelley’s adaptation will stick to this particular script. Only the seventh and climactic episode has been held back by HBO. Throughout the first six hours made available for review, no answers are forthcoming, with things running in place more than they should. 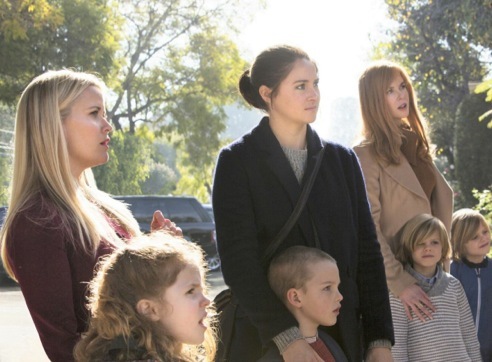 Big Little Lies also can be too much of a treatise at times, bogging down instead of building momentum with its multitude of principal and supporting characters. They also include Madeline’s slowly festering husband, Ed (Adam Scott); her ex-husband, Nathan (James Tupper); his second wife, Bonnie (Zoe Kravitz); and community theater director Joseph Bachman (Santiago Cabrera). Yes, there’s also a subplot in which Madeline strives to strong-arm the adult puppet drama Avenue Q into production against opposition from a “decency” brigade led by Dern’s Renata. Witherspoon gives the showiest performance as Madeline. “I can’t even keep track of all the fights you start,” says husband Ed, suggesting there should be an app for that. Kidman is most effective in prolonged scenes with her therapist, during which she progresses from denial to a growing self-awareness. But the most affecting performance is by Woodley as Jane, who’s lovingly raised her son while also battling her demons. Jane also is more relatable as a mom making do without attendant creature comforts while her newfound friends live lifestyles of the rich if not famous. Whatever its denouement, Big Little Lies isn’t stitched tightly enough to be a truly great miniseries. Its teachable moments tend to be worn like signboards, with the preachments piling up while the overriding double mystery keeps getting dangled like a piñata hung too high for all those first-grader to reach. Although billed by HBO as a “darkly comedic drama,” none of it is much if any fun to watch. So don’t think Desperate Housewives. If you do, you’ll be disappointed.